I think I’ll try to stick with Theme Weeks every week, and see how it goes. This is an It’s a Kind of Magic Week, with a decided arcane theme. The rollout of all-things-Rifts continues from Palladium, with one of their most important and popular books finally in PDF. Many hundreds of spells, magic items, and everything to do with magic all over the Megaverse. This is it, the ultimate guide to magic for Rifts Earth. 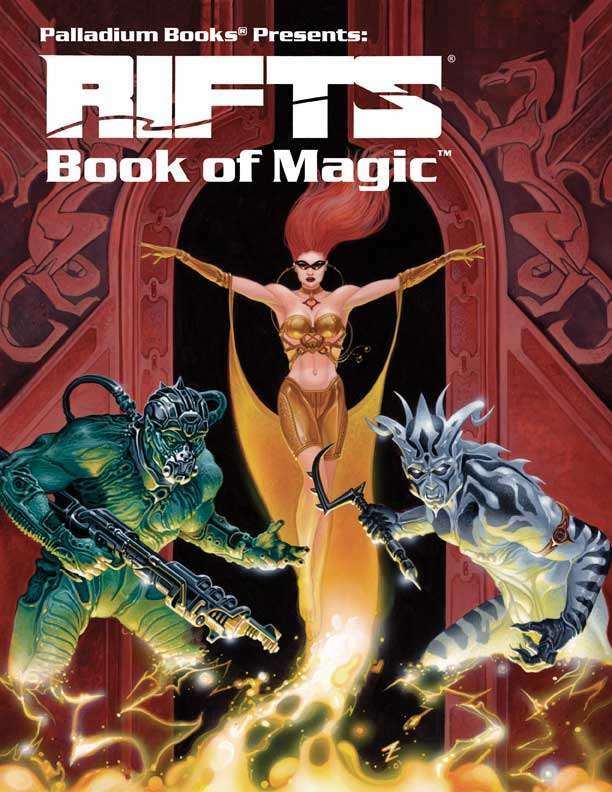 All the magic spells, magic tattoos, Techno-Wizard items, magic weapons, equipment, body armor, restraints, parasites, symbiotes, magic items, armor, automatons, Iron Juggernauts, and more from Rifts® World Books 1-23, Sourcebooks 1-4, and Siege on Tolkeen 1-6, collected into one big reference. 850+ spells of great variety. 370+ magic items, weapons and devices. Elemental Magic, Temporal Magic, Ley Line Magic, Cloud Magic and Necromancy. Tattoo Magic, Nazca Line Magic, Nature Magic, Whalesongs and Ocean Magic, and more. Magic Songs, Chants, Biomancy, and Iron Juggernauts. Techno-Wizard weapons and devices, Rune Weapons, Millennium Tree wands and other magic items. Magic herbs, plants, components and symbiotes. Shamanistic magic, Fetishes, Talismans and more. Comprehensive index of Practitioners of Magic. Designer notes, comments, tips & hints for running magic characters. 352 pages of magic and wonderment.